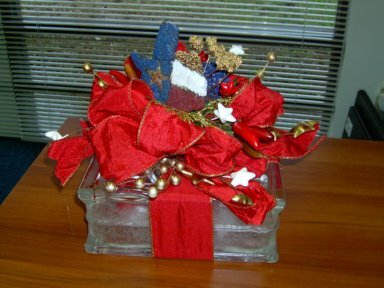 "Holiday Expressions", Charlotte and Gladys (2007): "Texas Born and Bred"
Charlotte wrote, "We participated in several craft sales last year, but this year Gladys opened her home and we invited all of our family and friends from work, church and community. What fun we had visiting with everyone and helping them select decorations for their homes and gifts for their family and friends. It was a raging success and everyone is looking forward to next year. Of course, we show everyone what we have and do custom orders. This year my goal is to get a website set up. And we will do another private sale at Gladys' home around the first weekend of November.""